It’s funny how we can sometimes experience something old in a new way or with a different perspective than we had previously. As a child in school, I never really cared for history but now I can’t get enough from books or on TV. When it comes to my faith, I am amazed how I can read the same piece of scripture and get a completely different message based on where I am in that point of my journey. I had this type of experience recently when I read an article about a protein called Laminin that I had heard about a few years ago. My faith has grown in ways I could have never imagined since then. The result was that this information was very exciting to me in this season of Lent. According to Merriam-Webster dictionary, the protein Laminin is a “glycoprotein component of connective tissue basement membrane that promotes cell adhesion”. It is accurately described as a protein that “holds us together” and the fact that this protein is found in the shape of a cross created lots of attention in sermons, blogs, and in the media. This was so cool and the timing was appropriate as we remember the incredible sacrifice Jesus paid for each of us on the cross on Good Friday. The Bible verse above reinforced its significance to me. I hope it has a similar impact to all of you who run and want to improve your physical and spiritual bodies through regular prayer and exercise. I did a little research to see if there was anything I was missing before I posted this information. There were many interesting blogs, papers, and reports on this subject from both sides of the fence. However, it was one that was written by a Christian biologist which reminded me to be cautious and that we should not have to look at proteins in the body or other signs in this world that may or may not have any meaning. After my brief research, I still concluded that this is amazing and don’t believe it’s purely a coincidence. 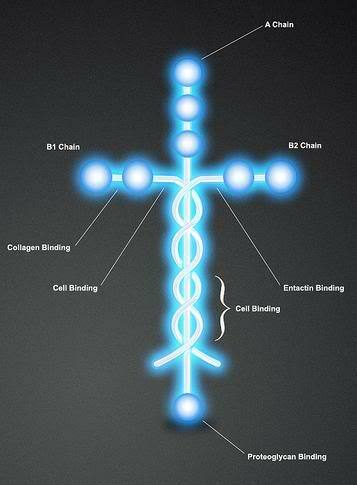 The significance of the shape of this protein and its function of acting as the glue for our body is a beautiful reminder of our Lord and Savior who created us. What I did take away from what I read was that it’s not a sign or “proof” that we need, but faith. All of us might be tempted to read or look around for signs or messages from above, However the only place anyone should be looking is in the Bible. The Bible teaches all we need to know to strengthen our faith. It requires us to regularly open and read His Word to learn, believe, and practice the lessons He teaches us. This is a re-post from Easter 2012 and I thought it was a great reminder for us once again. I am a Christian, Father of 4 wonderful children, Husband and Passionate Runner. I hope to help others experience that running can be a powerful approach to strengthen their Faith and improve their fitness. This entry was posted in Challenging, Colossians, Prayer and tagged Christ, Faith, fitness, God, Laminin, Marathon, running, Ultramarathon, Ultrarunning. Bookmark the permalink. Nick – You may know by now, but the repost at the end is just a Sprint ad. I’m sure you had more. Thanks BIll. Not much I can do about those ads. You and the choir were great tonight. Just a word of thanks for your continued commitment to sharing God’s message with us through blogging, running and fellowship. I hold you (and Yeng, along with all the other courageous runners today) in my prayers today. What a glorious day God has given us to celebrate in unison, “we won’t back down”! Thank you for the wonderful words and powerful prayers. It was an great day to be in Boston, to be a part of something special, and to see an American win given the events of last year. I also loved seeing both winners give glory to the Lord for helping them in their success…Something we all should do more of.